BABASSU OIL – extracted from kernels of nuts from the Babassu Palm. COLD PRESSED / REFINED WITHOUT CHEMICALS. The Babassu Palm tree grows in the Amazon Rainforest. The oil is taken from the kernel of fallen nuts from the palm trees, to ensure sustainability. This edible oil has very similar properties and uses to Coconut Oil, except that some people prefer the taste of Babassu Oil, and the fact that it is not as greasy as Coconut Oil, makes it the perfect moisturizer. It is non-comedogenic, meaning it does not clog pores, which is ideal for acne skin. Add to that the fact that Lauric acid, an antibacterial, makes up about half of the Babassu’s composition, and you have the solution to an acne moisturizer. Babassu Oil is rich in anti-oxidant Vitamin E, which helps prevent free radicals in skin cells, and heals scars, while its phytosterols provide a collagen boost. 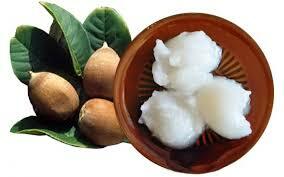 Babassu Oil soothes skin irritations like eczema or itchy, inflamed skin. Its deep, yet non-greasy moisture, allows you to add a little bit of the oil to your hair conditioner, shampoo or body wash, for an extra moisturizing experience. Cook with Babassu Oil, or preferably pour it raw over your food, to benefit from its array of antioxidants and healthy fatty acids. Spreading it on toast, as a healthy alternative to butter, is a favorite among Brazilians. It hardens a little, in cold weather, like Coconut Oil, but easily melts once it touches the body, so you can use it as a body moisturizer all year round.